I recently held a talk for http://www.dotnet-developer-conference.de/ About – Microservices and Scalable Backends with Azure Service Fabric, and also a Transition path from a legacy application to scalable application. Regarding Microsoft’s Technical Summit(); is an event mainly for developers, providing announcements round to Microsoft’s developer Stack. Again, a sensation to the topic Microsoft and Linux: Microsoft joins the Linux Foundation and is a Board Member there in the future! At the same time, Google is member of the .NET Foundation! Microsoft has unveiled a Visual Studio for Mac OS X. The new IDE is however no porting existing Visual Studio, which runs only on Windows, but only an extended version of the product beginning 2016 in relation to the acquisition by Xamarin with purchased Xamarin Studio, which in turn is based on the free Mono develop. The new IDE supports the first step in the Microsoft strategy “mobile first, cloud first” only the development by Xamarin apps for iOS and Android, as well as Web applications and REST based Web services with .NET core. The programming languages can choose the developer between c# and f #. Visual Studio “15” is now called Visual Studio 2017 and is now available as a release candidate. Visual Studio 2017 and Visual Studio for Mac now offer a graphical view of the preview for Xamarin forms. So far, developers could write XAML tags in the editor and only saw the result at run time. Graphic design by mouse, the developers of WindowsPresentation Foundation (WPF), Silverlight or Windows universal apps are used, is still not possible on a Xamarin Forms interface. .NET core, ASP.NET core and entity framework core version 1.1 released. ASP.NET 1.1 core should be 15 percent faster and equips numerous functions (URL rewriting, response caching, HTTP compression, new process host listener, use of view components per day helper, new locations for sensitive data) after. In entity framework core 1.1, Microsoft provides some programming functions from the predecessor entity framework 6.1 again at the disposal, which were missing in entity framework core 1.0. This searches for objects in the cache with find(), explicitly load of related objects with load() method, renewed preloaded objects with reload()loading as well as the simple query of object content, old and new, with GetDatabaseValues() and GetModifiedProperties(). Also the mapping to simple fields instead ofproperties and the recovery of lost database connections (connection resiliency) to the Microsoft SQL Server or SQL azure is possible again. The ability to map objects to the memory-optimized tables from Microsoft SQL Server 2016 is brand new. In addition, the makers have simplified the API with the standard functions can be replaced by entity framework core by their own implementations. .NET 1.1 core Linux Mint 18, 42.1, OpenSUSE come with macOS 10.12 and WindowsServer 2016 as operating systems added. Samsung delivers core for Tizen also .NET.A further step in the direction of cross-platform compatibility of Microsoft products.NET represents core for the Tizen operating system, the Samsung, since June 2016Member has developed the .NET Foundation, together with relevant Visual Studio Tools. The new Visual Studio Mobile Center is a cloud application, the hosted on Github source code for IOS and Android apps automatically translated at each commit, testson real hardware and distributed successfully tested app packets to beta testers. Also, a usage analysis and run-time failure is possible. The supported programming languages are swift, objective-C, Java and c# (Xamarin). Support for Cordova and Windows universal apps is planned. SQL Server for Linux: In March, Microsoft announced to provide the SQL Server in the future also for Linux. There is now a preview version of the database server for RedHat Enterprise Linux, Ubuntu Linux, macOS and Windows, as well as docking available. A version for SUSE Linux Enterprise Server is to follow soon. The latest release is called SQL Server Community Technology Preview vNext and represents an evolutionof SQL Server 2016, with new features in addition to the platform independence were shown in the keynote, nor previously listed on the website. For the SQL Server 2016, a Service Pack 1 available now, that contains significant improvements in the licensing model in addition to bug fixes. Shortly before Christmas 2015 was the TFS 2015 Update 1 released, within this release are some new features that bring more productivity to Team Development and DevOps. Lots of my customers have TFVC (centralized version control) in TFS. When Git support came out, the only option they had if they wanted to switch to Git was to create a new “Git-based” Team Project and port source code over. Then they got into a horrible situation where work items were all in the TFVC Team Project, and the source code was in the new Git Team Project. You can also add TFVC to a Git Team Project! This makes sense if you want to source control large assets. That way you can have your code in Git, and then source control your assets in TFVC, all in the same team project. If you’re looking for alternatives to supporting large files in Git, then you’ll be pleased to note that VSO supports Git-LFS. Unfortunately, it’s not in this CTP – though it is planned for the Update 1 Release. As a matter of interest, the real issue is the NTLM authentication support for Git-LFS – the product team are going to submit a PR to the GitHub Git-LFS repo so that it should be supported by around the time Update 1 releases. Customizing Kanban columns is great – no messing in the XML WITD files – just open the settings, map the Kanban column to the work item states, and you’re good to go. But what if you want to query on Kanban column – or get a notification if a work item moves to a particular column? Until now, you couldn’t. Board Column – which column the board is in. Bear in mind that the same work item could be in different columns for different teams. Not only can you query on these columns, but you can also add alerts using these fields. That way you could, for example, create an alert for “Stories moved to Done in the Testing column in the Expedite Lane”. There’s a lot to discuss under this heading. If you’re using the Kanban boards, you’ll want to upgrade just for these enhancements. TFS 2015 RTM introduced field customization, so not much has changed here. There’s an additional setting that allows you to show/hide empty fields – if you’ve got a lot of cards, hiding empty fields makes the cards smaller where possible, allowing more cards on the board than before. Under board settings, you’ll be able to customize the Columns (and their state mappings, Doing/Done split, and Definition of Done. Again you’ll see a drag/drop theme allowing you to re-order columns. The same applies to the swimlanes configuration. Under “Charts” and “General” you’ll be able to configure the CFD chart as well as the Backlogs (opt in/out of backlogs), Working Days and how your bugs appear (Backlogs or Task boards or neither). These settings used to be scattered around the UI, so it’s great to have a single place to set all of these options. You can drag/drop to reorder, check to mark complete and add new items. The Task board also gets some love – conditional styling (just like the Kanban cards) as well as the ability to add a Task to a Story inline. As a bonus, you can now also add new Team members directly from the Capacity page – without having to open up the Team administration page. You can see how the widgets actually preview the changes as you set them. Similarly, to add a Build widget to the Dashboard you need to navigate to builds and add it to the Dashboard of your choice from the list of Builds on the left. Now I have a really cool looking Bugs Dashboard! You can also just link the PR to a work item to fulfill the policy. As Karen wrote about in the dashboards futures blog, one area we’re focusing on is improving the discoverability and ease in bringing different charts to your dashboard. With this update, you’ll see a new option to add a build history chart from the dashboard catalog, and you’ll be able to configure the build definition displayed directly from the dashboard. The first version of the markdown widget allowed custom markdown stored inside the widget. You can now choose to display any markdown file in your existing repository. Or add the file to any dashboard in your team project directly from the Code Explorer. Microsoft announced the Azure Stack at its Ignite event Last year , for running something like Azure on-premises, but how does it differ from the existing Azure Pack, which kind-of does the same thing? This answer goes to the heart of how Microsoft is changing to become a cloud-first company, at least within its own special meaning of “cloud”. Ignite attendees heard about new versions of Windows Server, SharePoint, Exchange and SQL Server, and the common thread running through all these announcements is that features first deployed in Office 365 or Azure are now coming to the on-premises editions. Why azure pack and azure stack? We all living in cloud computing world now. IT people talk about “Cloud” more often. Microsoft Azure is in the top of the list providing proven stable cloud services. It includes IaaS (infrastructure as a service), PaaS (Platform as a service), SaaS (Software as a services) and lot more cloud related services. As we all know azure been very successful with availability, security, performance etc. But most of enterprises, businesses are already done lot of investment to build their infrastructure. This is much more valid for managed service providers. So instead of moving all the service to cloud, people are started to more interest on hybrid-cloud model. So some services will be using public cloud services and same time some services will be run from the datacenter. To address hybrid-cloud model Microsoft decided to bring the azure technologies to the public so companies can use same technologies used in azure in their own datacenters. So the result was “Azure Pack”. Windows Azure Pack provides a multi-tenant, self-service cloud that works on top of your existing software and hardware investments. 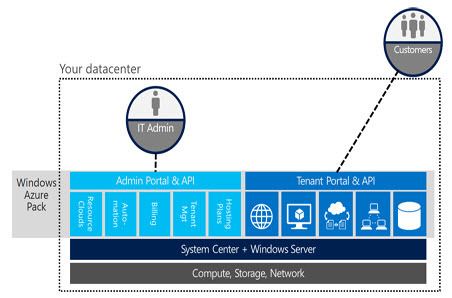 Building on the familiar foundation of Windows Server and System Center, Windows Azure Pack offers a flexible and familiar solution that your business can take advantage of to deliver self-service provisioning and management of infrastructure — Infrastructure as a service (Iaas), and application services — Platform as a Service (PaaS), such as Web Sites and Virtual Machines. This was big relief for the MSP as they can offer a portal to their customers to manage their resources efficiently. Azure pack is mainly depending on the infrastructure which is running based on windows server and system center. It uses system center virtual machine manager to manage virtual machines. It uses system center service provider foundation service to integrate all the related operations between portals and services. Following are some great features of azure pack. 7. Console connect feature to connect to VM remotely even physical network interface not available. Well azure pack was the first big step toward the path, but the technology keeps changing every day. With new version of windows server software defined storage, software defined networking will do revolution change. To face this new requirement solution is the Azure stack.Microsoft keep sharpening up the azure platform. With azure stack, it will bring same proven cloud capabilities to the hybrid-cloud. In other words, there is more Azure and less System Center in Stack versus Pack, and that is a good indication of Microsoft’s direction. That said, Microsoft’s Azure Stack slide says “powered by Windows Server, System Center and Azure technologies,” so we should expect bits of System Center to remain. Microsoft Azure Stack extends the agile Azure model of application development and deployment to your datacenter. 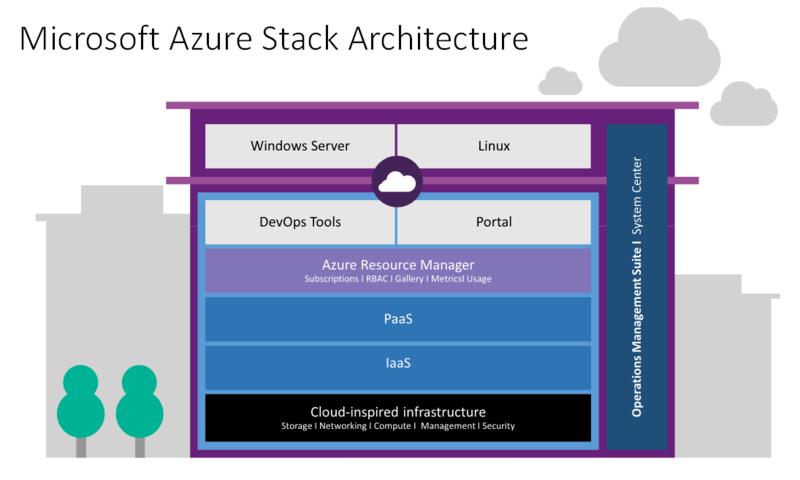 Azure Stack delivers IaaS and PaaS services into your datacenter so you can easily blend your enterprise applications such as SQL Server, SharePoint, and Exchange with modern distributed applications and services while maintaining centralized oversight. Using Azure Resource Manager (just released in preview last week), you get consistent application deployments every time, whether provisioned to Azure in the public cloud or Azure Stack in a datacenter environment. This approach is unique in the industry and gives your developers the flexibility to create applications once and then decide where to deploy them later – all with role-based access control to meet your compliance needs. Built on the same core technology as Azure, Azure Stack packages Microsoft’s investments in automated and software-defined infrastructure from our public cloud datacenters and delivers them to you for a more flexible and secure datacenter environment. For example, Azure Stack includes a scalable and flexible software-defined Network Controller and Storage Spaces Direct with automated sync and failover. Shielded VMs and Guarded Hosts bring “zero-trust” software-defined security to your private cloud so you can securely segment organizations and workloads and centrally control and monitor access and administration rights. Furthermore, Azure Stack will simplify the complex process of deploying private/hosted clouds based on our experience building the Microsoft Cloud Platform System, a converged infrastructure solution. Inside of azure pack it was “depending” on system center services. But Azure Stack will not “depend” on system Center but it is possible to integrate it with operation management suite and system Center . Despite this disparity, Microsoft’s general approach seems to be to evolve and optimize server products for Azure and Office 365, and then to trickle down features to the on-premises editions where possible. It therefore pays for developers and admins working on Microsoft’s platform to keep an eye on the cloud platforms, since this is what you will get in a year or two even if you have no intention of becoming a cloud customer. This approach does make sense, in that characteristics desirable in a cloud product, such as resilience and scalability, are also desirable on premises. It may give you pause for thought though if the pieces you depend on have no relevance in Microsoft’s cloud. We have already seen how the company killed Small Business Server, for which the last full version was in 2011. That brings us to Azure Stack, the purpose of which is to bring pieces of Azure into your data Center for your very own Microsoft cloud. The existing Azure Pack already does this, but this was essentially a wrapper for System Center components (especially SCVMM) that allowed use of the Azure portal and some other features on premises. I try to put together most of the Microsoft technology announcements from Connect 2015, some of the news where updated at 30 November with RTM releases of .NET 4.6.1, NET Core and VS 2015 Update 1 . VS 2015 Update 1 and TFS 2015 Update 1, will both happen on November 30th. and one of the many feature updates that comes with is the updated NuGet Interface in Visual Studio, that allows now also NuGet Multiple Package Update. 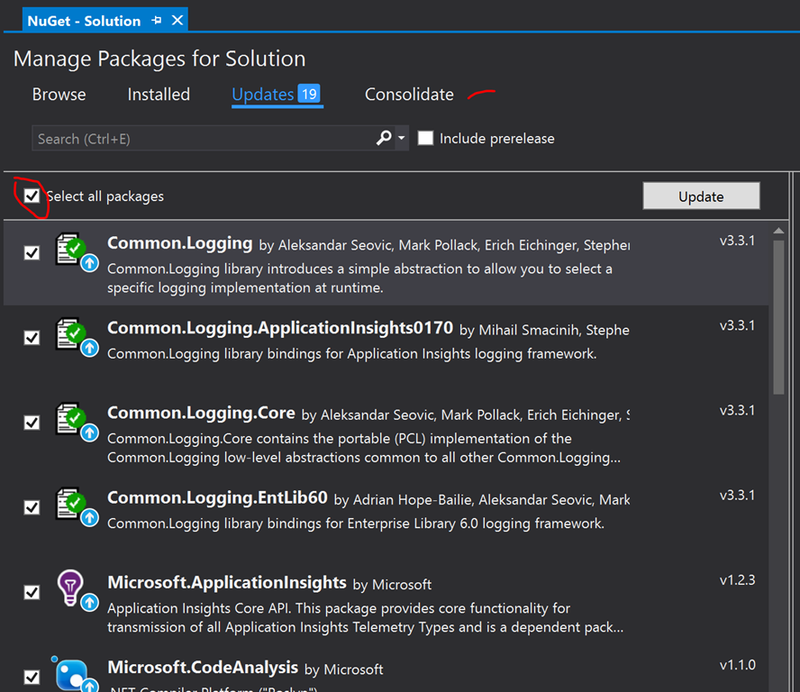 Till now was also possible in NuGet command console with – Update-Package command on Solution Level. Introducing free Visual Studio Dev Essentials program. .NET Core 5 Release Candidate and ASP.NET 5 Release Candidate are now available. A beta of Visual Studio Code, also now available and open source. This is kind of like how you can get Adobe Creative Cloud or Office 365, if you’re familiar with that. You pay a monthly or yearly fee like Office 365 and get Visual Studio and a bunch of other benefits. 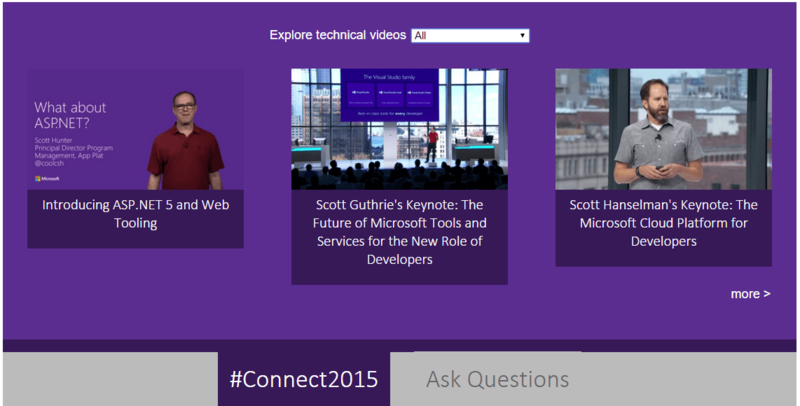 Announcing the new Visual Studio Marketplace! Node.js Tools 1.1 for Visual Studio is out, still free, still open source. Debug native code on devices with the free Visual Studio GDB Debugger Extension! And if you’re doing really serious IoT or embedded work, native Android libraries, Linux kernel modules, or small boards like Raspberry PIs, check out http://visualgdb.com which is an amazing and very complete 3rd party add in for Visual Studio! If you’re doing Arduino development, check out http://www.visualmicro.com which has a brand new version and really lights up Visual Studio with some powerful features like an automatic Arduino Board Downloader. Azure Service Fabric available in public preview.